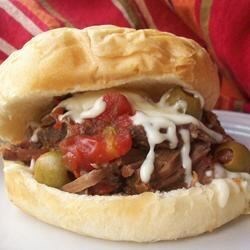 "Beef, tomatoes, and green olives served over crusty rolls. We always asked Mom to make this when we were young. Serve with salad." Place chuck roast, stewed tomatoes, and green olives with the reserved liquid into a slow cooker. Cook 6 hours on Low, until the roast falls apart easily. Serve over kaiser rolls. Added crushed garlic, onion powder, and next time will add peppercorns. Delicious! This is the perfect dish to serve the night before Thanksgiving or the night before Christmas Eve. It's delicious, easy, quick and frees up the kitchen for Holiday cooking! Soooo easy! And yummy! I've made this several times, and served it over brown rice. The kids like it because it doesn't have too many vegetables.